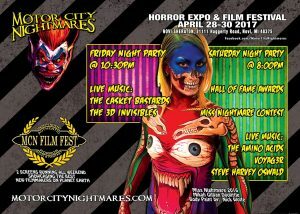 Some of the guests at this years #motorcitynightmares include: George A Romero, Lloyd Kaufman, Tom Savini, Sid Haig, Tom Atkins, Dee Snider, John Russo and many more! 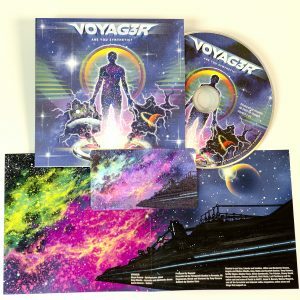 Voyag3r contributing new song to Rise of the Synths documentary film companion album! Lakeshore Records is releasing a special companion album in support of the crowd-funded film The Rise Of The Synths. The album will feature many of your favorite synthwave artists. Over the next few weeks, we will be announcing the bands appearing on the album. 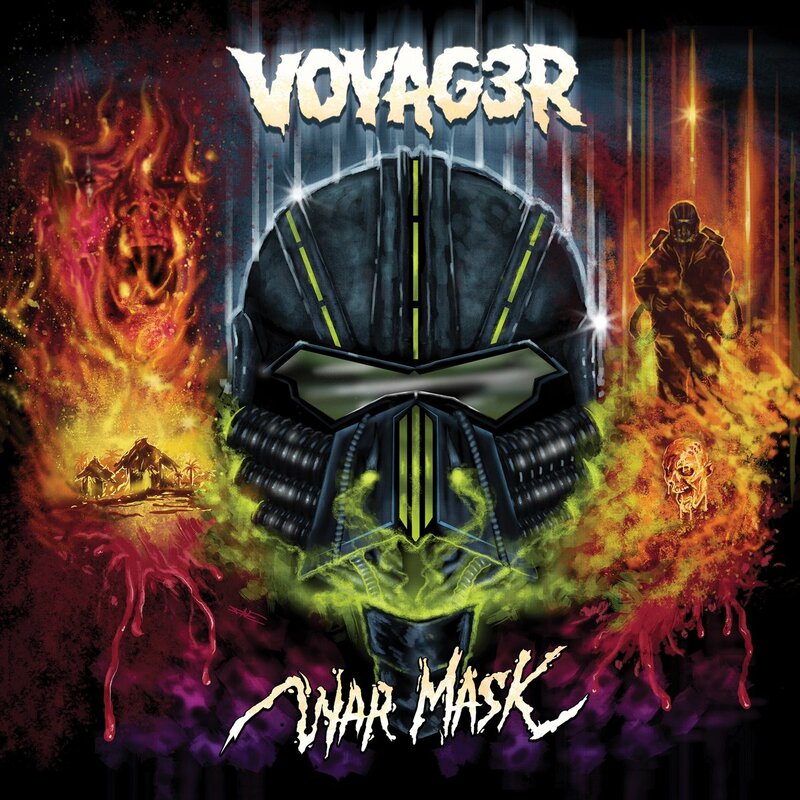 First up: Detroit-based synth-heavy, prog-rock trio VOYAG3R. THE RISE OF THE SYNTHS is a feature documentary directed by Iván Castell and produced by Javier Moreno with an amazing team from Spain. The film is the definitive documentary about synthwave and ’80s retro and electronic music. The filmmakers’ crowd-funding campaign is running right now. Head over to IndieGogo to give them your support! Thanksgiving terrors! 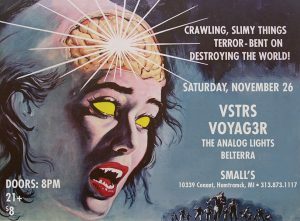 Synthwave and atmospheric rock take over Small’s! VSTRS, VOYAG3R, The Analog Lights and Belterra lead the resistance against the creeping death and the robots sent back to terminate you! 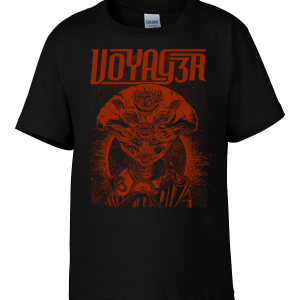 2 New Voyag3r T-Shirts now on Sale! 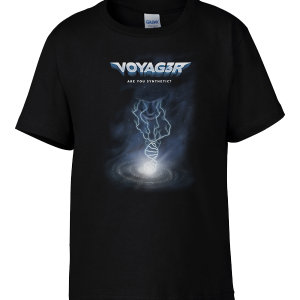 We have 2 new t-shirt designs for you! “Creature” illustrated Craig Horky and “Are You Synthetic?” illustrated by Slasher Dave. Both shirts are screen printed and are on a Gildan Soft T. The print is amazingly soft! You’ll love these shirts! Sizes Small – 2X are available. Both shirts are in stock and ship worldwide. Order today via our Merchandise Page! VOYAG3R live Saturday, August 13 at the NEW WAY BAR in Ferndale, MI. We will be playing 2 sets for you that night and our friends Bastardous will warm you up. Doors are at 8pm for this 21+ show. Killer concert poster by Mark Rudolph. New review of ‘Are You Synthetic?’ just in from Popshifter Magazine. Check it out! 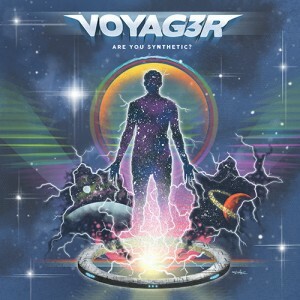 Music Review: Voyag3r, Are You Synthetic? 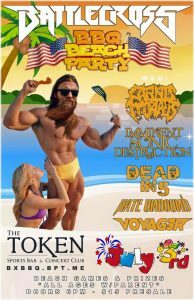 Voyag3r have been added to the Battlecross BBQ Beach Party happening Sunday, July 3 at the Token Lounge in Westland, MI. Doors are at 6pm for this show and Voyag3r takes the stage at 6:30pm. 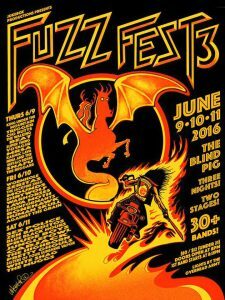 We are very happy to announce that Voyag3r will be performing at Fuzz Fest III at the Blind Pig in Ann Arbor, MI. The fest will be held June 9-11. 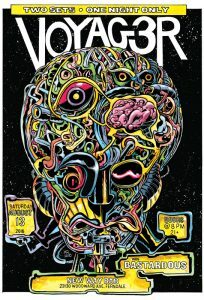 Voyag3r plays on Thursday, June 9. More info via the events Face Book page.